John noted that the Lean playbook is public knowledge, yet he is astonished that so few companies are fully committed to it and do it well. How true, given that we know so much more about all aspects of Lean management today compared to 1987, from leadership to sales to product development to supply chain management. It is indeed hard to believe that conventional management still dominates while Lean remains a niche management practice. John recalled how in 1988, Danaher’s standard cost accounting system nearly killed kaizen and ended Shingijutsu’s work. But a site visit to Jake Brake in Bloomfield, Connecticut, by the owners of Danaher convinced them that kaizen was the way to go despite short-term financial problems (no production work while fulfilling sales from inventories). John recalled how, initially, he was the typical CFO concrete-head as a result of his prior corporate finance experiences. His work at Danaher changed that, which led to him introducing Shingijutsu to Otis Elevator, a unit of United Technologies Corporation, followed by Carrier and Pratt & Whitney (Disclosure: I worked at Pratt & Whitney from 1988-1999). John recounted the unfavorable initial impression that his boss, George David (future CEO of UTC), had of the work that Shingijutsu did at an Otis manufacturing facility in Bloomington, Indiana. John the went on to show the financial results from several companies: Danaher, PCI Group and Rau Fasteners, Sturm-Ruger, UTC, Whitcraft Group, and Wiremold. He discussed the importance of profit sharing with employees to help make Lean work as planned. John said, “Kaizen equals wealth,” and showed how Shingijutsu’s work helped create over $170 billion in shareholder value for the these companies. John spoke about Speed Design Review (SDR), Shingijutsu’s process for rapidly cycling through idea-prototype-evaluation. This process at Spatz is named Si2 (Spatz Integrated Innovation System) by Spatz. The objective is to increase the speed of bringing new products and new brands to customers and markets. The work done by John and his team is remarkable. They created small-footprint R&D cell with cross-functional participation and using human creativity and right-sized equipment. This enables them to generate ideas, make prototypes, and quickly evaluate them. They do as many as 250 cycles in a week. With speed being paramount, they do hand sketches instead of time-consuming computer renderings, use right-sized desktop equipment for prototyping, and evaluate and discuss the results in a “Why Why Guy-A Guy-A” (noisy-talk) bullpen. The lead-time from idea to approved marketing prototype is reduced from 6-9 months to 1 week. The lead-time from idea to market is reduced from 18-24 months to 6-9 months. The 6-9 months is not shorter because it is paced by their customers’ bureaucratic approval processes. This is driving Spatz to develop its own brands. It is a great example of large customers who are unwilling to learn from small suppliers who are more capable of quickly getting products to market. Mabe Company is a Mexican manufacturer of appliances and a GE Appliance joint venture partner. Agustin and Daniel spoke about their recent experience over the years in genba kaizen and how Speed Design Review has helped Mabe bring new products to market more quickly. Unlike Daryl Williams’ story of a struggling GE Appliance division, Mabe adopted genba kaizen, Speed Design Review (SDR), Production Preparation Process (3P), Systematic Integration of Quality Materials and Information (SiQMi) over the last several years as a response to intensifying competition. They too transitioned from physically separated units and functional silos to obeya and cross-functional teams working together to create new products for customers and grow the business. They abandoned their tollgate product development and functional approval processes and transitioned to an integrated, collaborative product development process. As in so many cases, the committed, disciplined application of end-to-end improvement processes yields spectacular results. Dr. Kaplan began by noting that the three most change-resistant industries are healthcare, higher education (my industry), and government. He described many of the barriers to change that exist in healthacre which he had to confront and which he and his team successfully broke through to make Virginia Mason the quality leader in healthcare. He described the first Japan Genba Kaizen Seminar he participated in 2003 and the numerous Japan study tours he has participate in since them. 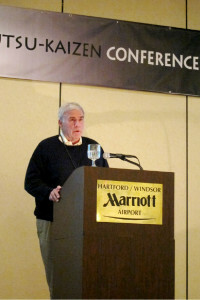 Dr. Kaplan described the results of Shingijutsu kaizen on patient outcomes, staff, physicians, etc. Dr. Kaplan noted that VMMC was late (6 years into their improvement efforts) in comprehending the “Respect for People” principle (Disclosure: I did Lean leadership training for Dr. Kaplan and his executive team in 2009, which prominently featured the “Respect for People” principle). He spoke about a one-page visual control that described the top 10 ways VMMC show respect to people in how they treat each other and as they work together to create the perfect patient experience. 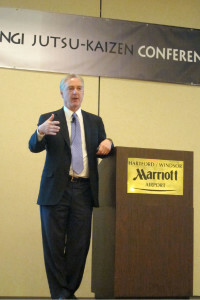 Dr. Kaplan cited kaizen as the pathway to both higher quality and lower cost. And, he noted that constant change means that people must develop the ability to adapt and improve. Kaizen helps people do this. Q: What kind of specific activities should I take as a leader to promote kaizen? A: Just get started at the genba. Take the first steps to make physical change, which reveals the next step to take. Leaders must be involved. They must lead by example. Q: Can I begin Speed Design Review (SDR) if my organization has not yet established a genba culture? A: The CEO has to get involved, be committed, provide support, and work as one team towards one goal. It requires tenacious leadership. Start with small successes and accumulate more successes. Q: How should we staff a kaizen promotion office (KPO)? A: Find people with the spirit of change to lead the KPO, and challenge KPO staff with opportunities to grow. Q: In Speed Design Review (SDR) you create obeya to remove physical silos. How do you remove mental silos? A: Start by changing the physical layout and then follow the SDR process with 100 percent commitment to the new direction. 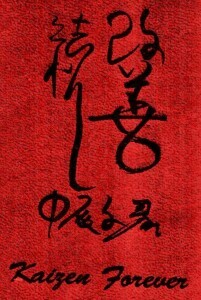 Hoshin kanri helps to keep people and departments aligned. Q: We used to have many weeks of kaizen with Shingijutsu. How can I generate interest in Shingijutsu-kaizen again? A: Top management of you company has the wrong mindset and must re-commit to kaizen. They must re-energize themselves and the spirit of kaizen. Q: We have been doing kaizen since 2009. What is the method to evaluate our kaizen achievements? A: Go to the genba to see how you have changed it. When you have a serious health problem, you can’t fix it by taking a pill. You need shock treatment, a painful treatment, otherwise you won’t be cured. Kaizen means taking action; go to the genba now, deal with the facts now. Always take action; that is the key. This concept needs to go to the next generation for kaizen to survive and thrive, to continuously succeed. Mr. Yoshino closed out the conference by promising to hold a similar event at least once a year. He asked the participants attend the next Conference and invite their friends and colleagues to study authentic Shingijutsu-Kaizen and its evolution. In summary, it was a great conference. As I reflect back on what Shingijutsu consultants taught me beginning 20 years ago, I can safely say that they taught me how to think. And for that I am grateful. To me, they were like a stern music teacher who is tough on beginners because they want to see you advance to the next level, the level after that, and so on. Then, when you master the basics, they become benevolent teachers who have confidence in you to continue practicing what you were taught, to make it your skill, your philosophy, and your knowledge. That is exactly how I evolved and developed my own path, focused on Lean leadership. As Nakao-san said: “To make good product, you have to make good people.” Sensei, arigatōgozaimashita (先生、ありがとうございました). 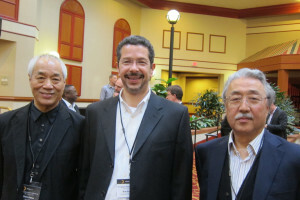 Photo: Dr. Emiliani with Mr. Chihiro Nakao and Mr. Toshihiro Nagamatsu during a conference break. Photo: Image of the embossed logo on the beautiful black leather padfolio distributed to conference attendees (shown in red to provide contrast).